I get in a slump, where I eat tons of salads. I love them, and I’m fine with it, but I don’t think my stomach is fine with raw vegetables all the time. So I’m in that area right now where I’m forcing myself to eat more cooked vegetables, and change it up. It helps that it’s Fall, too. I kind of forget how yummy celery is. Just crisp, clean and crunchy. I bought some, and it sat in the fridge for a while, then I decided to use it all up and make some random veggie dish. Here’s what I ended up with (I’m also on a mustard kick lately-so many options!). I brought a pot of water to boiling on the stove, and salted/peppered it. 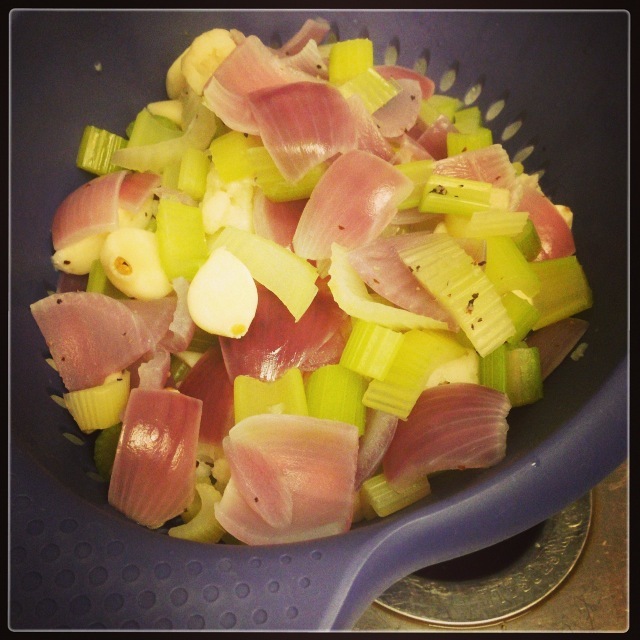 Then I added the celery and garlic since they’re more firm. 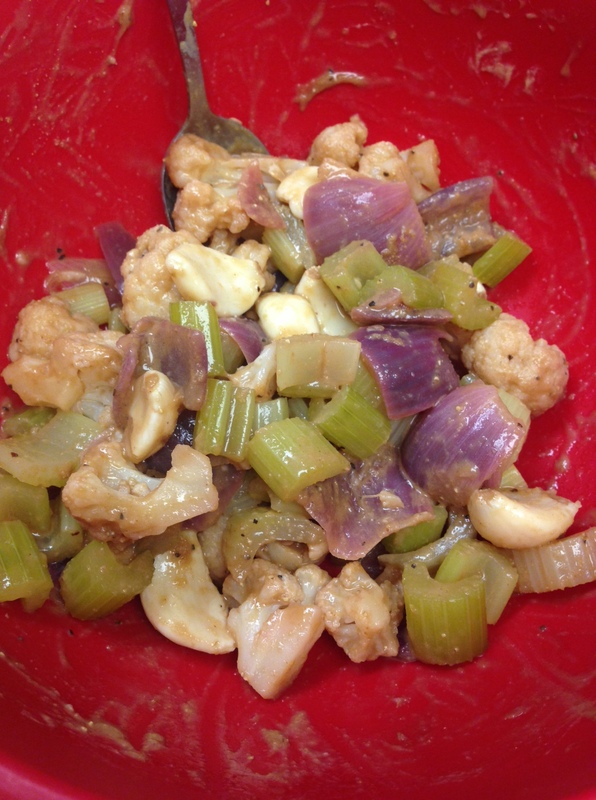 I kept everything boiling, then added the onion and cauliflower. Once everything was cooked, but not mushy, I strained it. I tossed it in some organic honey mustard and a drizzle of balsamic vinegar, with an additional season of salt and pepper. So good. Sorry for the crappy pictures. 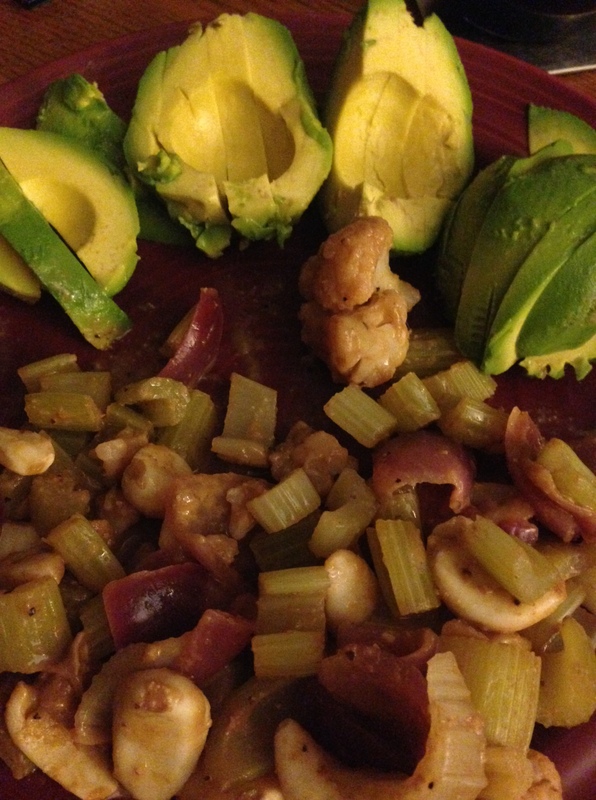 This entry was posted in Recipes and tagged Balsamic Honey Mustard Vegetables, Balsamic Vinegar, Cauliflower, Celery, Cooked Vegetables, Honey Mustard, Paleo, Whole Garlic by livinglikelinds. Bookmark the permalink. Do you eat whole cloves of garlic? Isn’t that way spicy?! Not when they’re roasted or cooked-they’re super yummy 🙂 Raw = too spicy!